“Once the Adventure Game core rulebook is released, we’d like to commit to a robust release schedule of support.” Those were the words that Dominic McDowall-Thomas, the CEO of Cubicle 7 Entertainment, used when we were finalizing the discussions that brought Far West‘s game releases to the company for distribution in game stores world-wide. What, I asked, does “robust” mean in this context? “Ideally, a new release every eight weeks or so,” came the reply. Over the past week, TS Luikart and I have discussed options, carefully weighing our own availability (we still have the additional material which we’re producing for Kickstarter backers), the non-game material which we’re also working on for Far West, the stable of freelancers we have at our disposal, etc., and came up with a slate of projects for the first year of support for the Far West Adventure Game. Earlier this week, I had a conference with Dom over Skype, where we discussed the projects, and he gave us the green light for production. 2) Fists of the Far West: Secret Scrolls of Kung Fu — An expanded martial arts sourcebook, with new styles, advanced design options, new Edges, etc. 3) Hissing Boiler, Burning Engine — The Cog Science (steampunk tech) sourcebook. New gear, advanced design options, setting material on tech-based groups and locations, etc. 4) Death on Horseback — A second adventure collection (important, we think, during the first year, to set the tone) with 6 more self-contained adventures for Far West. 5) Narrator’s Screen and A Town Called Prosperity — Taking the one non-exclusive stretch goal from the Kickstarter, and producing a print version packaged with a screen (similar to Cubicle 7’s gorgeous screen and Laketown sourcebook for The One Ring. The sourcebook will detail a full Far Western town, including all NPCs and adventure hooks… plus links to download fold-and-build papercraft models of the buildings, scaled for use with miniatures. 6) The Steel Remains: Legendary Weapons of the Far West — A sourcebook detailing unusual martial arts weapons, famous weaponsmiths, Legendary Weapons and Artifacts, etc. So there you have it. The first year’s worth of releases for the Adventure Game. More details will be forthcoming, regarding release dates, authors, and format (page counts, hard vs softcover, etc. ), and of course, there will be announcements of non-adventure-game-related releases coming as well (more fiction, for example). This all begins when the Far West Adventure Game core rulebook is released this summer! 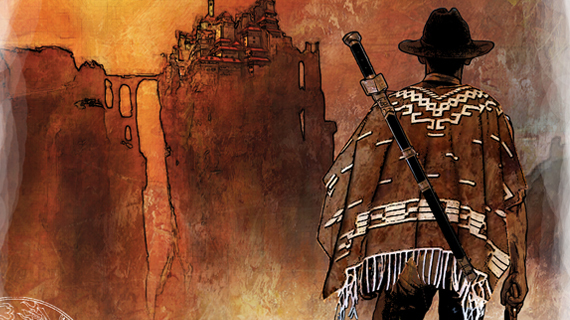 The Kickstarter Stretch Goals included a print supplement called Legends of the Far West. That’s not listed in the upcoming year layout. Is it part of the additional material which you’re producing for Kickstarter backers? I assume it is; however, I figured I’d ask just to be certain. Best of luck on the future of Far West. Yes, it’s additional material. Legends of the Far West was described in the stretch goals as an exclusive — so it will be only going to backers, as a special release and therefore not listed as part of the overall release schedule. May I ask what will happen with the epub (or kindle) edition of the core book? Will the next books come in kindle format? The books will be available in EPUB and MOBI (Kindle format) here at the Far West web store, and possibly on Amazon as well (I need to double-check our contract with C7). Lots of love for players in this lineup, but don’t forget your storytellers/GM’s! You need a book of villainy in there too. A bestiary, a listing of venomous organizations and right bastards, or a combination of such, for us to inflict on players. There’s an entire chapter in the core book devoted to that — called “A Fistful of Bastards”. We figure that will take care of Narrators initially. Plus there will be villains, organizations, and critters a-plenty appearing in the adventures (with notes on using them outside of those adventures), as well as in the other supplements. Our philosophy is to make each release as multi-use as we possibly can! Um, I’m not sure if you guys realize this, but “The Steel Remains” is the name of a novel by Richard Morgan. I don’t know if that really has any bearing on this, but I just thought you should know. Personally, I wasn’t aware, but, as you say, there’s no real bearing — that’s only part of our full title. Thanks for pointing it out, though — so we can make sure that our cover design and title font choices don’t cause any undue confusion with folks looking for Morgan’s book. A Weird West supplement for an alternative version of Far West would be great. Making it easier to use the rules to emulate something similar to The Sixth Gun comic from Oni press.